Good morning beautiful ladies! You are going to love our front porch today. The beautiful Barbara Roose is joining us with her Bible study book Beautiful Already . If you are a woman, then you will benefit from this book. 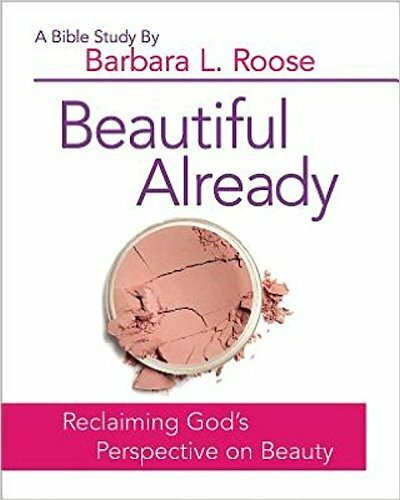 In a society that constantly puts pressure on us to look a certain way, Barbara’s book speaks God’s wonderful truth to us that we are beautiful to Him. She addresses practical issues that plaque us every day and makes the Scriptures come alive in how they apply to us. I think all of us know God loves us, but Barbara helps us truly grasp the truth that He loves us regardless of what we think we see looking in the mirror. Her sweet spirit brings a smile to my face and I know you will love getting to know her just as I have! Beautiful Already is bible study that guides women on a journey to discover their beautiful Christ-centered identity. Women, including Christian women, struggle with comparison, low self-image and image related baggage from their past. Beautiful Already gives women an opportunity to discover how to challenge the culture’s impact on our perception of beauty and learn how to live our God’s beautiful truth in our life. I began Beautiful Already in March 2015 and it was due on August 31. At the time I was writing the bible study, I served as the Executive Director of Ministry at my church. It was challenging to write a 200-page study while balancing my full-time ministry responsibilities and family. It was a time of tremendous personal and spiritual challenge that God used to usher in some big changes in my life. What was your favorite chapter or part of the book to write and why? My favorite chapter of the Beautiful Already Bible study was on the three mirrors of culture and focusing on God’s mirror from Matt 6:33. It’s a great visual for how to reframe how we see ourselves. What was your biggest challenge or hurdle in writing and publishing your book? Me. Self-leadership. Everyone will face high-level pressures, emergencies and person development crisis. My personal spiritual disciples journey had to raise its game in order to deal with the increased pressures while writing the book. I needed God’s power and provision to write the study and He carried me through. If you could go back through the writing, publishing, and marketing experience would you do anything differently? A TON! I would have created more space to send my work out to critique groups more often. My next project will include much more feedback from a trusted group of folks. What other writers/books inspire you? For 14 years, I was on staff at a local church. One of our core staff values was learning from the best. So, I’ve read stacks of personal development, spiritual development and leadership books. Some of my favorite authors: Andy Stanley, Rick Warren, Bill Hybels, Craig Groeschel, Patrick Lencoini, Joseph Grenny, Brene Brown, Lysa TerKeurst and so, so many more. I started writing stories as a young child, but I didn’t get the confidence to write until I was in the 6th grade. I had a 6th teacher who encouraged me to write and I kept at it. What’s your favorite thing to order from the Olive Garden? Toscana Soup. I loved it even more once I found a copycat recipe. Say there’s like a whole box of Teddy Grahams in a room all by themselves. Say I left them there and told you not to eat any until I got back. How long would it take you to disobey my wishes? If we came to your house for dinner, what would you prepare for us? We’d have roasted corn chowder with shrimp and white bean relish, some kind of fancy salad, a fun beverage and you would bring the dessert. Where is your favorite or dream vacation spot? I love traveling and right now, I’ve got my eye on Paris. If someone wrote a book about your life, what would the title be? YES! When someone told me that once a bed is made, then 60% of the room is clean, that sealed it for me. I make up my bed every morning. To my readers and ladies that I haven’t met yet, I love you! My heart is for you to discover how precious you are and for you to discover what God wants to do for you and in your life. Where can we connect with you? Jen, thank you so much for having me on your Front Porch this week! It’s always a blessing to share what God has been doing and I look forward to staying connected.